Peninsula recently announced a deal with Salford City FC to become the main title sponsor for the club for the next five years. I wanted to talk today about why you might want to consider sponsorship opportunities for your own company. The right sponsorship of the right organisation or event, where it’s a good fit on both sides, can create a positive ROI for your business and can give you a competitive edge. The Salford City FC sponsorship so far has been a great success; we’ve had a huge amount of coverage following the launch of “The Peninsula Stadium” in the press, online and on TV, far more than we’d normally generate without the Salford relationship as leverage. We also had a great day at the stadium when many of our staff and their families attended a special Class of ’92 match to a sell-out crowd creating a real sense of goodwill. We’ve gained a great deal of profile through the relationship, whilst the club has benefited from a guaranteed cash flow for the next five years. So it’s been a win-win. You don’t have to do a sponsorship deal of this size to get benefits. Recently at my grandson’s football match, I was impressed by the range of logos on his team’s shirts and hoodies, all from locally-based sponsors; shops, hotels and other businesses, raising their profile in the local market as well as giving something back to the community. And a few things you need to watch out for when thinking about sponsorship. Make sure the event or brand you’re linking up with is a good fit; for us, Salford was perfect. We operate on the same guiding principles of change, innovation and we both strive to keep improving, so it worked well. Also, I was born and bred in Salford, so it was great to be able to contribute in a special way to the city. Do your research on the company or event you’re linking up with, to ensure it can only enhance your own corporate reputation – we can all think of sponsors who’ve had to withdraw because of negative publicity. 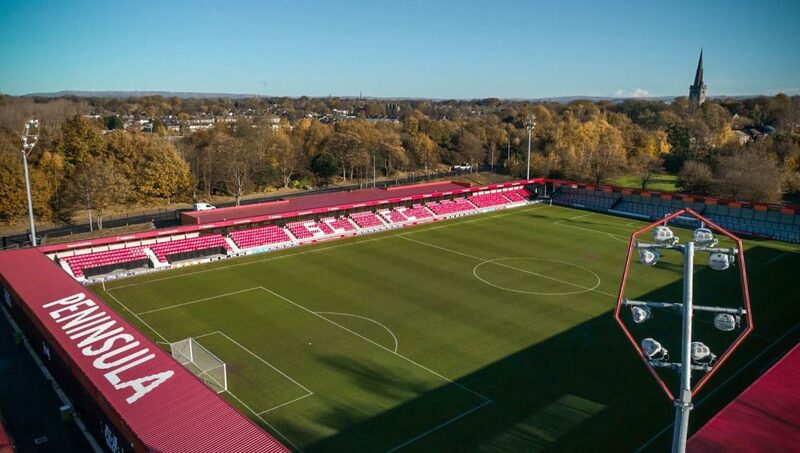 Develop a really close working relationship, because both sides need to maintain a sense of control and co-ordination around major launches and events; we worked hand-in-hand with the team at Salford FC so that everyone got the most out of the launch programme. Our work with Salford will now extend to an engagement programme with the local community which I’m looking forward to seeing develop. Why not think about looking at sponsorship for your business, even if it’s just the local sports club? Some local organisation will be very glad of your contribution and you may well raise your profile along the way for a relatively small investment.